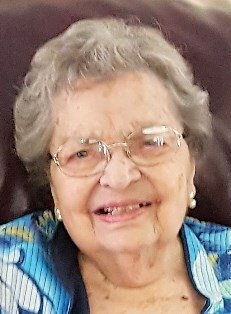 Obituary for Mrs. Mary Lenora (Dilts) Canada | Hinchliff-Pearson-West, Inc.
Mary Lenora Canada, 97, formerly of Galesburg, Illinois, died Thursday, January 17, 2019, at New Dawn Memory Care in Colorado Springs, Colorado. Mary was born August 29, 1921, in Winamac, Indiana, the daughter of Russell and Lenora (Obright) Dilts. She married Harold B. Canada on March 8, 1945, in Winamac. He preceded her in death on December 1, 2005, after over 60 years of marriage. Mary is survived by a son, James Harold (Marta) Canada of St. Louis, Missouri; a daughter, Mary Lee (Michael) Shoback of Monument, Colorado; 10 grandchildren; and eight great grandchildren. In addition to her husband, she was preceded in death by her parents; a son and daughter-in-law, Robert Earl and Carole Canada; a sister; and seven brothers. She graduated from Winamac High School in 1939 and from Purdue University with a B.S. Degree in Home Economics in 1944. At Purdue she was a member of the Alpha Chi Omega Sorority, Mortar Board, and Who’s Who in American Colleges and Universities. She managed cafeteria dining rooms at Wright Air Force Base in Dayton, Ohio before her marriage. Mary was Hostess for the Newcomer Greeting Service in Galesburg for 38 years (1961-1999) and organized the Galesburg Newcomer Club. She was past president of L.T. Stone Grade School and Churchill Junior High School P.T.A, the P.T.A. Council, and was awarded a Life Membership in P.T.A. She was past president of the GHS American Field Service (AFS), Junior Women’s Club, and Dandylions. She was a member and former secretary of Bridgeway’s Harrington Family Services. As a member of the Galesburg Chamber of Commerce, she served as Chairman of its Education Task Force. Mary was a member and past president of Chapter AN of P.E.O., a member of Sorosis, and a member of Home Economists of Knox County. For a year she hosted Adriana Kaplan, a foreign exchange student from Argentina. She was a member of the First United Methodist Church and served on the Church Administrative Board. She served on the Board of United Methodist Women and was a member and past Chairman of the Patience Circle. Mary served as secretary of the Galesburg Milk Fund for six years. Visitation will be 11 a.m. to 1 p.m. Saturday, February 9, 2019 at Hinchliff-Pearson-West Funeral Directors and Cremation Services Galesburg Chapel. Funeral service will follow at 1 p.m. with Pastor Mary Runge officiating. Burial will be in Memorial Park Cemetery. Memorial contributions may be made to First United Methodist Church, Bridgeway’s Harrington Family Services Foundation, the Milk Fund, or a charity of the donor’s choice. Online condolences may be made at www.h-p-w.com.